My Zortrax M200 Plus has been repaired, and after a bit of further fiddling with it is now producing satisfying prints. I'll show some examples below. Now obviously these are still not the quality of store-bought miniatures. For example you can clearly see the print layers. The models in brown I treated with acetone vapor, which improves the surface aspect. The others I haven't treated yet, and I'm not sure I will bother. In the end these figurines will mostly be looked at from arm's length away, on the middle of a table on a battle map. 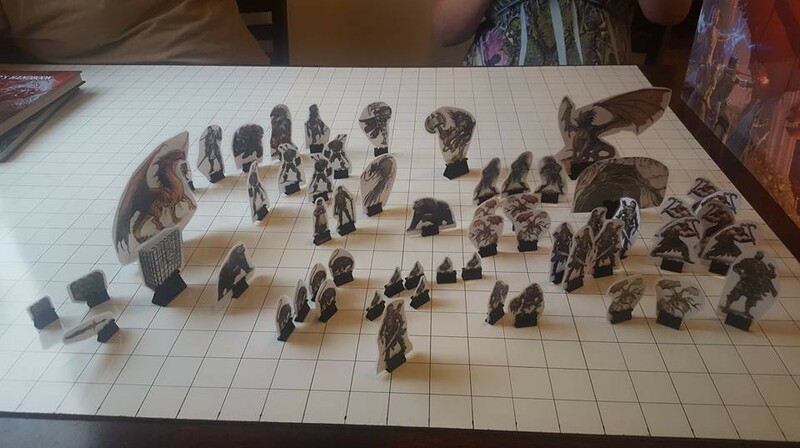 The main requirement is that the players can tell which figurine is the beholder, and which one is the basilisk, and I think this is clearly the case here. And they are cheap: The human-sized figurines are below 5 grams of material, including losses from printed rafts and supports. The large sized ones are below 20 grams. And the material is regular ABS, costing just 2.5 cents per gram. So even a large figurine costs me less than 50 cents, while a store-bought Reaper Bones human-sized figure costs $3. Yours are cheaper but let's be honest Tobold: they look like crap. That's obviously not your fault but a 3D printing issue. I used to play AD&D back when I was a teenager and even 30+ years ago we had an army of hand-made paper-crafted miniatues. We've never had any "positioning/visibility" problem because they were printed/colored on both sides and everyone could immediately identify them from ani chair around the table. I'm referring to something like this. I still don't get why perspective/positioning is a issue for you, to a point where you prefere to play whith those ugly miniatures. I rather like how tobolds look. Especially the big ones.. For that price Id buy a set. And 3d ones above those paper things any time. They look fine to me except I'm not wild about the blue colour. Have you thought about acetone vapors to "smooth" out the printing artefacts? It's pretty straightforward. It causes the surface to melt a bit. Maybe not to good on your skeletons, but if you have large focal pieces it could be an option. Looks good all the same! The figurines in brown, horse and the glabrezu, are acetone smoothed.